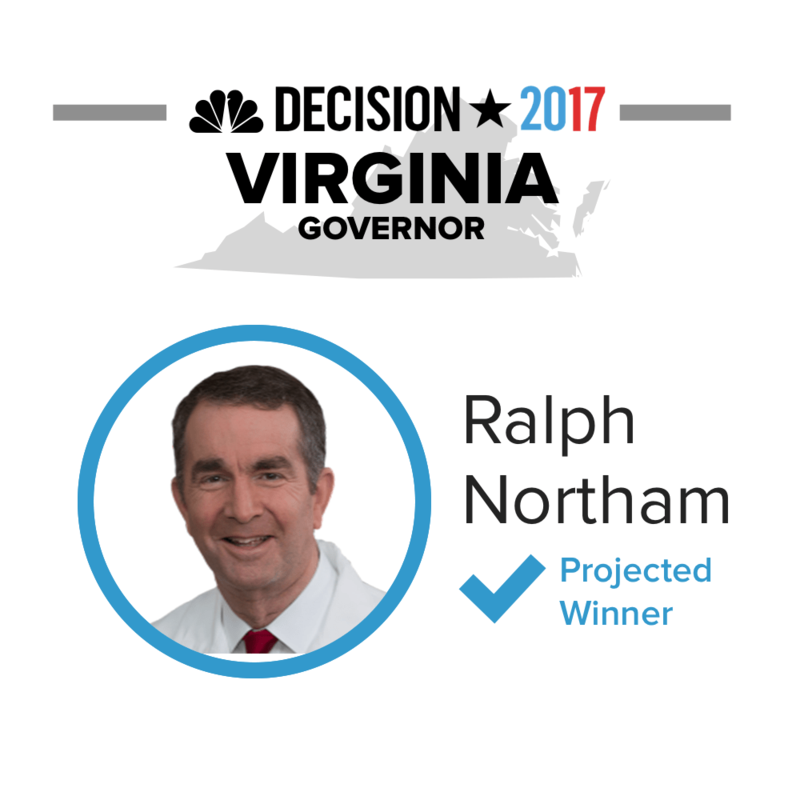 Democrat Ralph Northam bested Republican Ed Gillespie to win Virginia's governor's race, NBC News projects. Polls showed Gillespie closing the gap on Northam in the final weeks of what had become a bitter and negative campaign. But the Democrat easily held on Tuesday after a race in which he focused heavily on tying Gillespie to President Donald Trump. Hillary Clinton defeated Trump by five points in Virginia in 2016. Democrats began what they hope will be the start of a major political comeback Tuesday, nearly one year to the day Donald Trump pulled off an upset victory that left the party demoralized, leaderless and pointing fingers. Virginia Democrat Ralph Northam easily cruised to victory over Republican Ed Gillespie in a race in that looked as if it had been tightening in recent weeks. The success translated down the ballot as well, with Democrats making major gains in the state legislature. In New Jersey, Democrat Phil Murphy soundly defeated Lt. Gov. Kim Guadagno. Guadagno proved unable to separate herself from Gov. Chris Christie, who will leave office as one of the nation’s most unpopular elected officials. Democratic New York City Mayor Bill de Blasio handily won a second term, while voters in Maine chose to expand access to Medicaid, overruling the state's Republican governor. Virginia Gov.-Elect Ralph Northam condemned the president and promised unity in his victory speech on Tuesday night. Virginia's gubernatorial race focused on many of the themes that Trump himself ran on, including crime and immigration, with opponent Ed Gillespie running ads that accused Northam of aiding criminal immigrants by casting a tie-breaking vote against a sanctuary city ban while lieutenant governor. 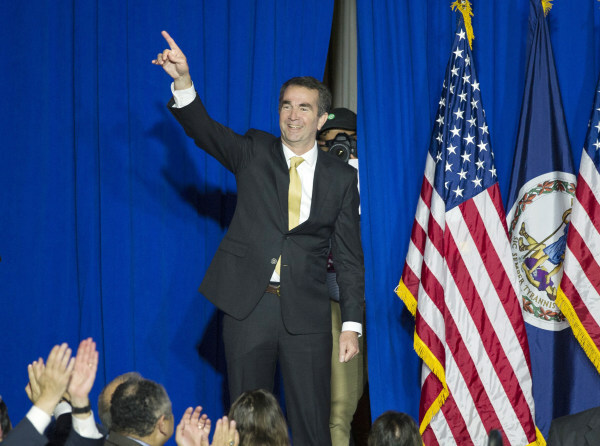 Virginia Gov.-elect Ralph Northam was rushed off stage by a security official at the start of his victory speech Tuesday night. Three protesters were seen heckling Northam and holding homemade signs, including one Northam sign with the word "sanctuary" written across it. The protesters appeared to be escorted out of the victory party. Northam said last week he would sign a ban on sanctuary cities as governor after Republican opponent Ed Gillespie campaigned on threats of MS-13 gang violence. Northam had previously voted against such a ban. Northam returned promptly to the podium to speak and did not address the disruption. Virginians turned out in large numbers Tuesday despite the rainy and cold weather that gripped parts of the state. More than 2,500,000 votes had been counted as of 10:16 p.m. Tuesday. That total dwarfs turnout for the past two Virginia gubernatorial elections. 2,240,314 voters cast ballots in 2013, and 1,984,934 voted in 2009. Democrats eagerly worked to mobilize voters in the state in an effort to repudiate President Donald Trump one year after his surprise election victory. 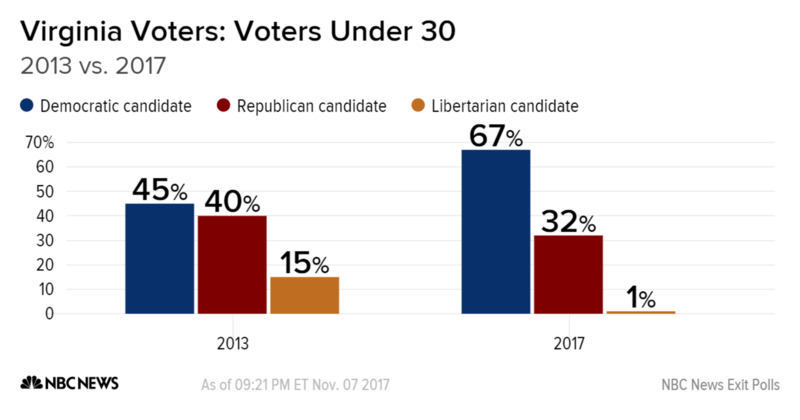 Republicans were hopeful Virginia, which Hillary Clinton won in 2016, would deliver another surprise blow to Democrats. 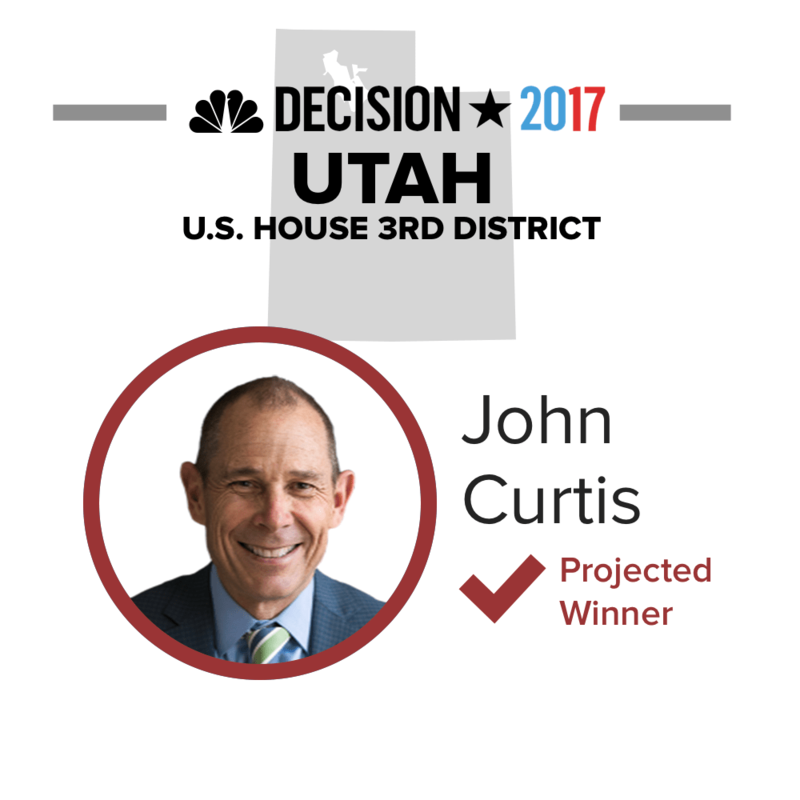 Republican John Curtis, the mayor of Provo, Utah, won the special election for Utah's 3rd Congressional District, NBC News projects, handily defeating Democrat Kathie Allen. With 69 percent of the vote in at 11:05 p.m. 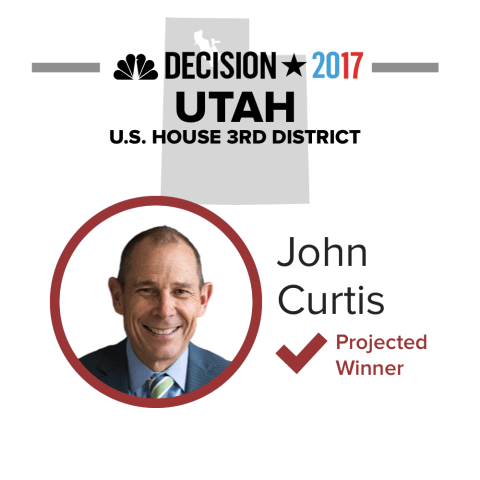 ET, Curtis had 59 percent of the vote, while Allen received 26 percent. Mainers voted to expand access to Medicaid through the Affordable Care Act on Tuesday, the Associated Press reported, overruling Republican Gov. Paul LePage. The ballot measure will give an estimated 80,000 low-income Mainers access to health care. It also offers an important test of the health care law's popularity amid efforts of President Donald Trump and other GOP leaders to dismantle it. Maine is one of 19 states whose Republican leadership declined to expand access to Medicaid under Obamacare. Maine is the first to use a ballot initiative to expand it anyway, after LePage vetoed five attempts by the state’s legislature to expand the program. Maine's ballot initiative could be the first of many: Advocates have filed paperwork to try and get initiatives on the ballot in Idaho and Utah in 2018. 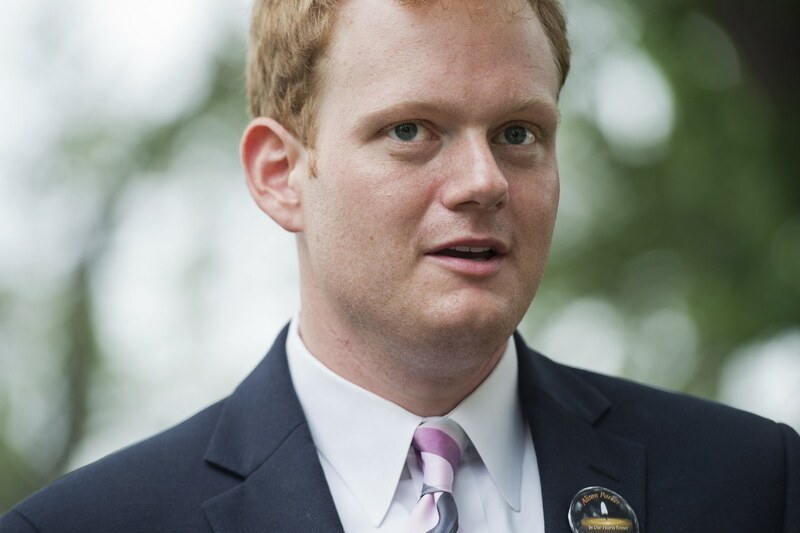 Democrat Chris Hurst, a former television journalist whose girlfriend was shot on live television, was elected to Virginia's House of Delegates on Tuesday. 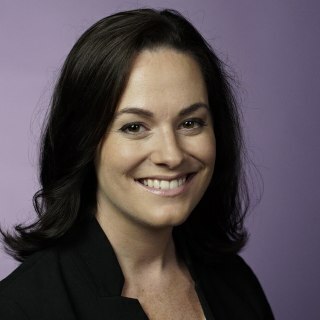 The Associated Press declared Hurst the winner over Republican Joseph Yost in what was one of the state's most expensive House of Delegates campaigns. Hurst spent six years as a reporter for WDBJ-TV where he met Alison Parker, a 24-year-old reporter shot and killed during a live broadcast in 2015. Virginia's Democratic Gov.-elect Ralph Northam picked up picked up support among a large number of subgroups Tuesday night, especially among voters under 30, white women, moderates and those with college degrees. 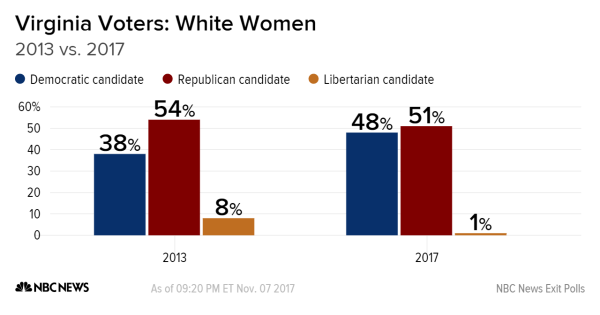 Among white women and voters under 30, Democrats improved on their margins compared to 2013 largely by taking support from Libertarian candidates. Among white women voters, Gillespie was still the favored candidate over Northam, but the Democratic candidate brought the edge to a 3-point margin. Democratic incumbent Bill de Blasio cruised to re-election Tuesday in New York City, NBC News projects. The mayor was expected to win handily despite less-than-stellar approval ratings, as he lacked a serious challenger in the general election or the primary before it. 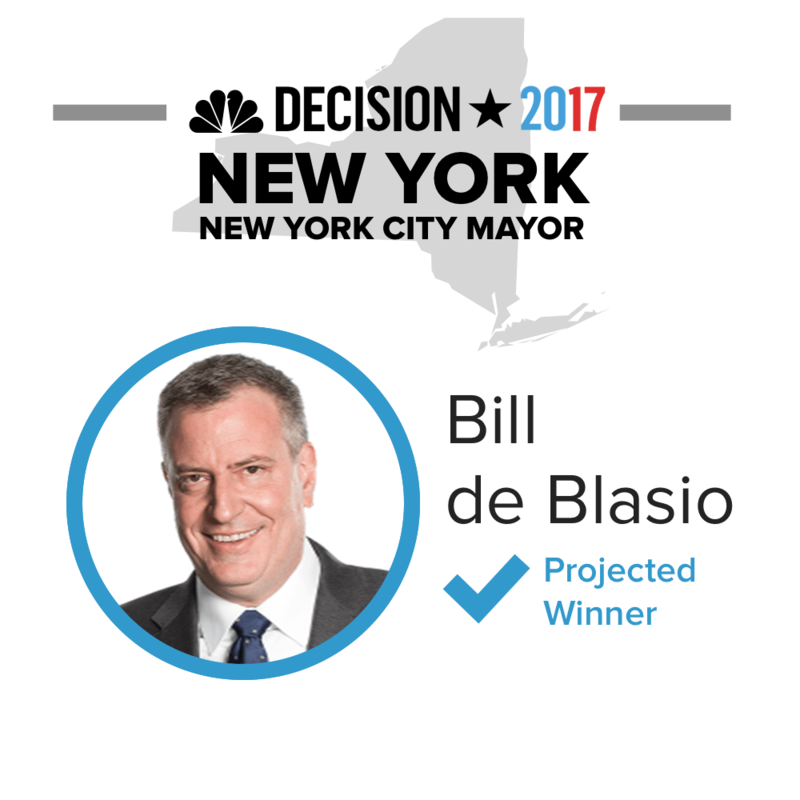 De Blasio is the first Democratic mayor to win re-election since Ed Koch's third-term election in 1985; he ran a low-key campaign that championed his investments in housing and education, namely free prekindergarten, his chief first term win. Virginia Democrats have picked up 10 House of Delegates seats and lead in seven more races, putting them within striking distance of taking the majority in the state legislature. Democrats needed to flip 17 seats heading into Tuesday to retake the majority. And while the gubernatorial contest between Democrat Ralph Northam and Republican Ed Gillespie has dominated national attention, the 100 seats in the state’s House of Delegates could end up being the true bellwethers to gauge Democratic Party's strength ahead of the 2018 midterms. Virginia House Democratic Leader David Toscano called the results “unprecedented,” noting that the last time Democrats won more than five seats in a single year was 1975. "This isn't a wave, this is a tsunami,” he told NBC News. 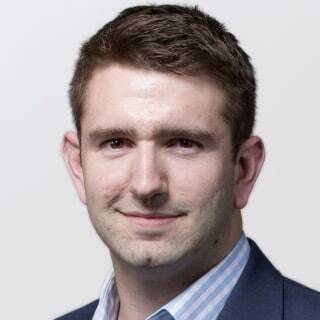 Alex Seitz-Wald contributed reporting from Fairfax, Virginia.